Mull is a Hebridean island with few settlements and a large areas of open wilderness populated by both rare and common wildlife. We landed on the island at Fishnish, having taken the ferry over from Lochaline on the Ardnamurchan Peninsula. It was a peaceful drive to reach our destination at Fionnphort, the most westerly tip of Mull. For most of the journey we were in single track roads through an open landscape of rocks and heather. 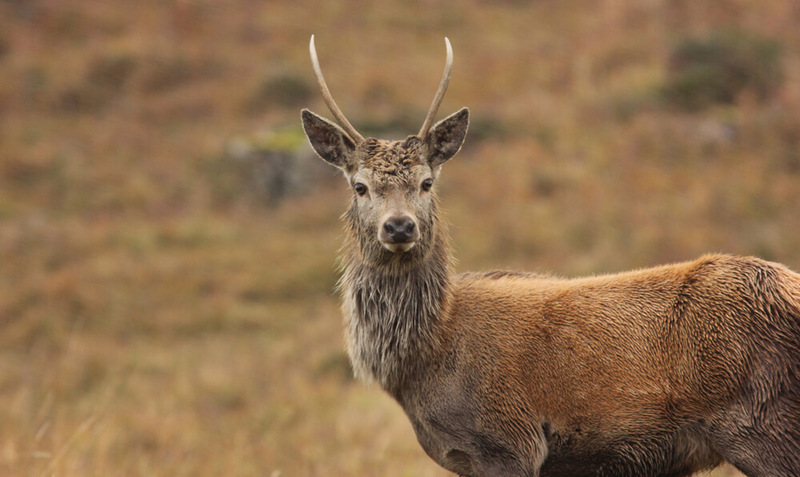 Half the journey threaded inland around the mountain of Ben More and the first wildlife we spotted were many deer. They were far from tame but easy to photograph using a long lens. We reached the sea on the other side of the island and the tiny road continued along the side of Loch Scridain. This was a magical part of the journey. The winter evening light glanced off the clear waters of the sea loch and by the road side the kelp swayed in the gentle tide reminding us of Ring of Bright Waters. We stopped in the quietness of the deserted road. 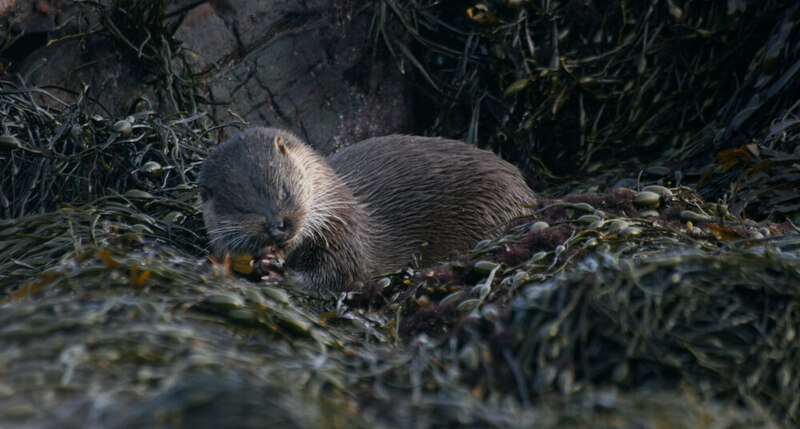 The engine off, there was no sound except the call of seabirds and lapping of the sea, we were entranced for ages by the scene and then we saw him, an otter playing in the kelp. What an amazing gift to be shown on a February evening. Twenty minutes before we reached the end of our journey we passed through the small lochhead settlement of Bunessan, this tiny village was welcome after all the wildness. There was a pub and a gathering of houses that reminded us of the village in Local Hero. Our base for the wildlife spotting holiday was Ross of Mull Bunkhouse, the comfortable accommodation, was warm and bright. The beds were made-up in our private room and the kitchen and lounge were great for meeting other guests and enjoying the fire. Ross of Mull bunkhouse is a 10 minute walk from the village of Fionnphort, the port for the ferry to Iona. The window of the bunkhouse looks past a standing stone from Iona’s Pilgrims trail onto the inland Loch Pottie which teemed with wildlife. Our first evening we took a footpath along the west side of the Loch and watched the Whooper Swans that were over-wintering on Mull. Another afternoon, later in the trip, Matt the owner of the bunkhouse, was chatting to us in the garden when he suddenly pointed to the sky and then down to the ground. Sure enough, gliding along the horizon in the next field, there was a Hen Harrier skirting the hedgerow looking for winter prey. I didn’t have my camera, but I will always remember seeing that rare bird. We made three trips from the bunkhouse. One was a short walk up Torr Mor, a high point above Fionnphort. From the top were amazing views of the whole east side of Iona, we could see the Abbey, the little cottages scattered among the heather and the white sands of Iona’s north beaches. As we approached the top of Torr Mor we surprised a Heron resting in the waters of an old quarry. I have never seen a Heron so close before and as he lumbered into the sky it struck me as appropriate that birds were descended from dinosaurs. 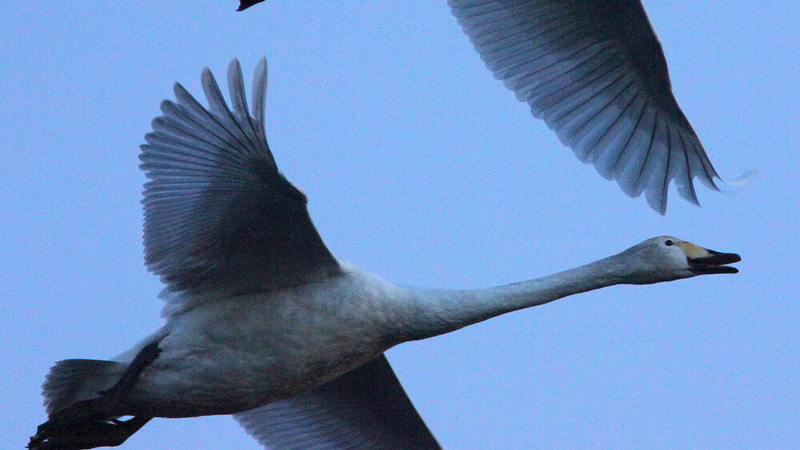 The Heron was grey with huge angular wings and long grey neck and legs. Amazed by the sight I was slow to raise my camera, but final got around to taking a photo as it few away high up in the sky. The second trip was over to Iona by ferry, an easy trip to make from Ross of Mull Bunkhouse, just 10 minutes walk to Fionnphort and a 10 minute ferry over the the island. Despite our February date and most of the island attractions being closed for winter, there were a few other visitors to the island. Iona is still very much a place of pilgrimage and we heard it gets busy in summer. When twice a day the tranquil road where we saw the Otter becomes a major highway triggered by the arrival of the ferry from the Scottish mainland. This is a very good reason to use the bunkhouse as a base and travel to the lona when the coachloads have returned to the mainland. Or visit out of season like we did. We walked the length of Iona to the white sandy beaches on the north of the island, looking for otters but were not so lucky wildlife spotting this time. The third trip we took was on the advice of another guest who had stayed at the bunkhouse offern and explored the island in depth. We drove to Bunessan, and this time took the tiny road via Ardtun rather than the route we have travelled before. Just before reaching Ardtun we took another turn up toward the coast. Soon we left the car by an old barn and carried on by foot to reach the isolated beach at Achnahard. The coast was magnificent, the clear waters sparkled around the rocks and white sands. This is the coast where our new friend had often seen otters playing freely in the surf. We were not so lucky this time, but what more could we expect. During out short wildlife spotting trip we had seen Whooper Swans, deer, freely roaming sheep and Hairy Coos, not to mention those lucky sights of the Hen Harrier, Heron and Otter. If you want to explore the wildlife, sea life and bird life of Mull or enjoy activities in the wild landscape of the Island, I highly recommend the Ross of Mull Bunkhouse or Achaban House next door as a base for your stay. Here is a full list of all accommodation on Mull in the Independent Hostels network.